"We are delighted to have been awarded the Cask Marque for the quality of our beer for the second year running and TripAdvisor have also given us a second Certificate of Excellence for consistently good reviews on their site." Santino had a long-held dream to find a country pub which he could make his own. After 15 years of working in some of the capital's finest Michelin starred restaurants and appearing in many television cookery programmes including Gordon Ramsay's Best Restaurant, MasterChef and Market Kitchen he was ready for a new challenge. In early 2014 he met Helen, born and bred in Reading and found someone with whom he could share his dream. 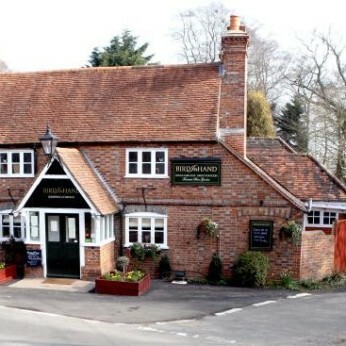 They fell in love with the Bird in Hand in the lovely village of Sonning Common close to both Reading and Henley. A 16th century coaching inn, with an inglenook fireplace, a large garden and backing onto Bird Wood, somewhere they could offer great local cask ales and wine along with beautiful, simple, fresh rustic food. In November they opened the doors. Dogs (with their well-behaved owners) are very welcome in the bar and garden but we ask that they are kept on a lead and off the furniture.